Types of Mesothelioma Cells | The Williams Law Firm, P.C. Physicians base a mesothelioma diagnosis and treatment plan in part on the type of mesothelioma cells present. The different mesothelioma cell types provide indicators of the cancer’s aggressiveness and help predict its progression, and they can inform treatments to extend lifespan and improve quality of life. Asbestos exposure is the sole known cause of mesothelioma. Mesothelioma is caused exclusively by asbestos exposure. 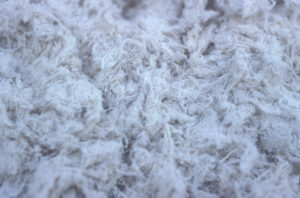 Over time, microscopic asbestos fibers that have been inhaled and accumulate in the body can cause chronic irritation to internal tissues and trigger mutations to cells that occur in the mesothelium, which is a membrane that surrounds certain organs including the heart and lungs. Following is a closer look at each cell type and how these cells affect the various forms of mesothelioma. 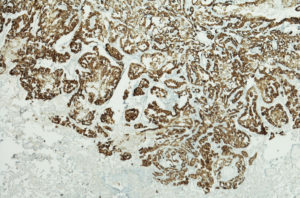 A micrograph of epithelioid cell clusters in a case of peritoneal mesothelioma. More than half of all mesothelioma cases are believed to stem from epithelioid cells, which are mutated epithelial cells (cells that line the outer surfaces of organs and blood vessels). Epithelioid cells cluster closely together and don’t metastasize as quickly as sarcomatoid cells. Those with mesothelioma related to epithelioid cells generally have a longer life expectancy and respond better to treatment, which may include a combination of surgery, chemotherapy and radiation. 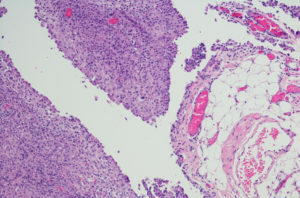 A micrograph of sarcomatoid cells in the pulmonary artery wall. Though rare, sarcomatoid mesothelioma cells are highly aggressive and resistant to treatment. Unlike epithelioid cells, sarcomatoid cells don’t adhere together and are prone to spreading throughout the body. Because sarcomatoid cells also tend to form nodules as opposed to tumors, sarcomatoid-based mesothelioma can be more difficult to detect than mesothelioma that develops from other cell types. The prognosis for individuals with biphasic mesothelioma depends in part on which cell type is dominant. Those with a higher percentage of epithelioid cells may respond better to therapy and have a longer life expectancy than those with higher levels of sarcomatoid cells. 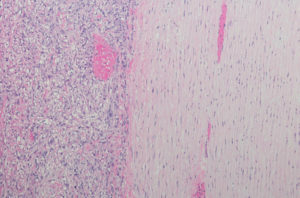 A micrograph of pleural mesothelioma, the most common type of the disease. Mesothelioma patients face overwhelming physical, emotional and financial challenges. The Williams Law Firm is dedicated to helping asbestos exposure victims and their families recover the compensation they need to cope with medical costs and other associated expenses. Led by New York mesothelioma lawyer Joseph P. Williams, The Williams Law Firm team understands the life-altering impacts of asbestos exposure, and we have an extensive record of success recovering the financial security mesothelioma patients and their families need to cope with this unforgiving disease. The Williams Law Firm provides free consultations to discuss your legal options and answer your questions, and we don’t charge for our services until we recover on your behalf. Please call 855-575-MESO (6376) to arrange your no-obligation consultation or contact us online to tell us your story now. The Williams Law Firm is based in New York, but we work with clients nationwide and can arrange to meet you in person or by video conference.